My Mobile Tracker is based on the idea that it’s always better to be safe than sorry. There are different situations in life where it’s imperative to know what your friends and family are doing just to know that they are safe and sound. Because we all know that every seconds counts in an emergency. My Mobile Tracker is designed to keep an eye on you and your location via GPS so that your loved ones can quickly find out if you’re in danger. Find out how the app works in today’s review. So what can My Mobile Tracker be used for in real life? The app is a mix of a Orwell-esque Big Brother and a good Samaritan that can prevent tragedy from occurring in a dangerous situation. In conjunction with the secQ.me (i.e. 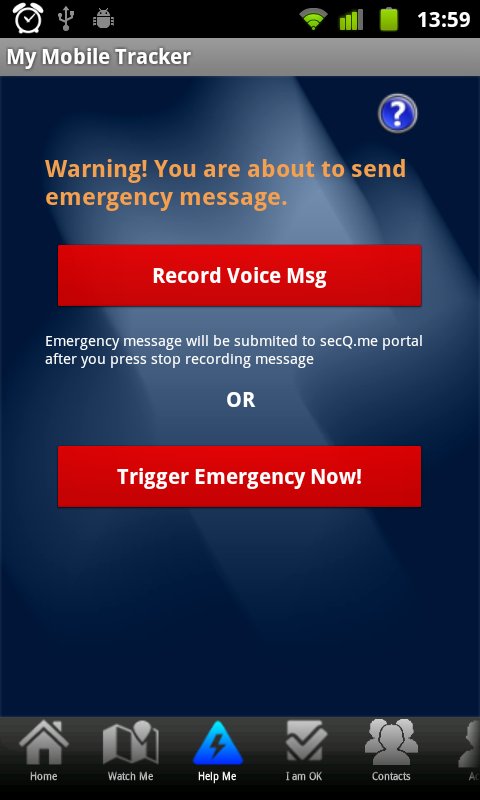 secure me) service the app can automatically contact a number of select contacts in the case of an emergency. Use the five free text messages included with the app to get in touch with your contacts in the case of an emergency. And the last point is how these guys make money. In order to send text messages to my emergency contacts, you have to acquire a so-called personal package which costs $5.95 a month. Included in the price is an unlimited amount of credit for creating emergency events (i.e. situations that are out of the ordinary) and 20 text messaging credits. If you need more credits, you can always purchase them via PayPal. On the secq.me website you can log yourself in and add your Facebook and Twitter accounts to work with the service. On top of that, you can add emergency contacts with email addresses and cell phone numbers. Finally, you can also view your current credit balance and “emergency events”. As part of the test, I decided to take it upon myself to give this app a try (without actually putting myself in danger, of course). So to start things off I need to create an event related to a perceived risky situation. I then add contact and choose SMS as the method for emergency notification. Now I can create what’s called a “Watch-Me” event that keeps track of your activity. 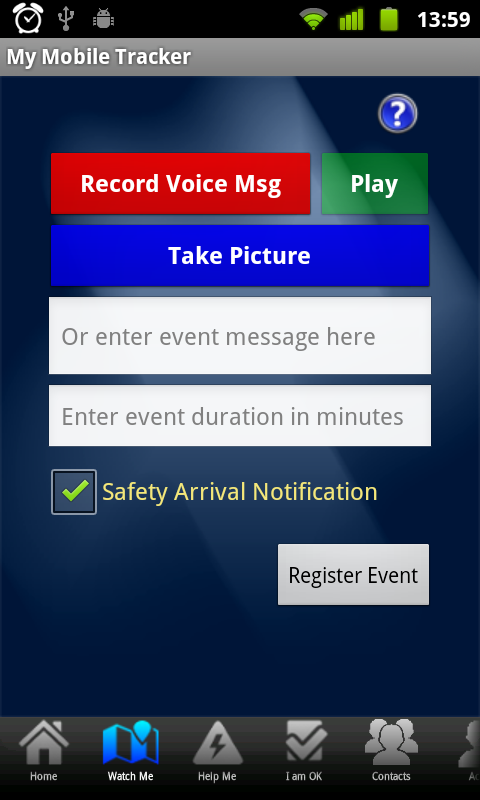 When creating the event, I can add a photo (of that suspicious person you met online, for example), record an audio message (e.g. “I am walking through Central Park in the middle of the night”) or enter in a text message with more information about my whereabouts. Finally, I can also enter in the approximate length of my event, which in my case was a five minute walk through a dark park. Then I can select whether my contact should receive a message when I get home safe and sound. It goes without saying that the GPS navigation has to be turned on for secQ.me to able to track your location. Two minutes into my walk home I receive a message informing me that I have three minutes left to make it to my goal. To confirm that I am doing fin, I have to slide a slider on the screen. For the purposes of the experiment, I decide not to react in order to see if the app will actually inform my contacts of the situation. And miraculously the app actually works! My friend received a text message and immediately called me to double-check that I was doing OK. Impressive! My Mobile Tracker is really a great app for people that like to play it safe and allow their location to be tracked via GPS to notify friends and family in the case of an emergency. If you happen to find yourself in a bind, the app could be a real lifesaver. Personally, I think My Mobile Tracker shouldn’t be used instead of calling the police, but it can definitely help keep your friends and family informed and prevent them from worrying too much about you. I’m not a huge fan of the My Mobile Tracker design, but I have to admit that it’s very functional. Everything is laid out in a logical manner and it takes just a few taps to change the settings. 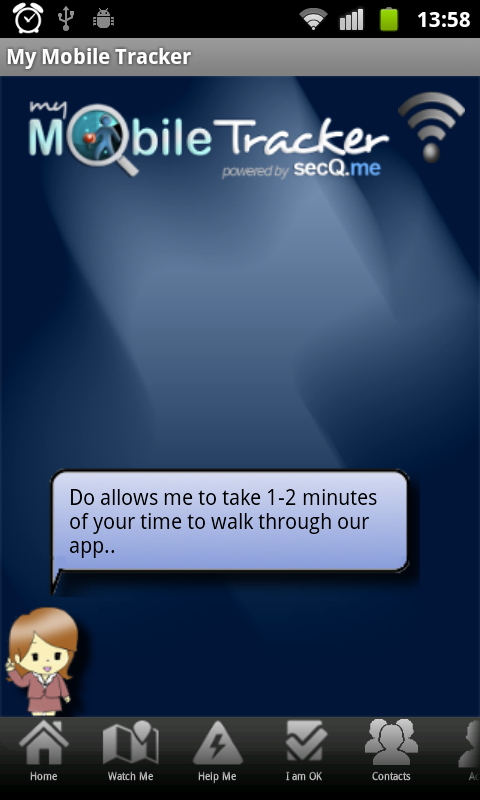 Navigating around the app is very intuitive after you’ve created your account on the secQ.me website. My Mobile Tracker is a very stable, fast and reliable. It couldn’t be any other way really for an emergency app. Since My Mobile Tracker is free to download you can try out the app without paying any money. If you find the app to be useful then it might make sense to pay a small monthly fee for a sense of security and comfort. Thanks for trying out our mobile app, in terms of SMS notification, our sms notification support more then 40 countries, for list of country supported, please check http://blog.secq.me/pricing/..
Australia is one of country we supported.. I think the assumption is that you are a responsible individual if you care about your safety enough to use this app. This could lead to some potential misunderstandings. Say you're out with your friends partying and you don't use the slide on your phone or you forget your phone on the table.....before you know it the police shows up thinking you're in trouble. Not a good situation. i wouldnt want my mother knowing where i am at every second. she'd call the cops every time i show up late for dinner ! Do write to us support@secq.me if you faces any issues on using the app..